Often times the things that hold us back in life are not our age, the current circumstances or other people. They are the things that we keep telling ourselves on a daily basis. Our minds can be our best servants but also our worst masters. 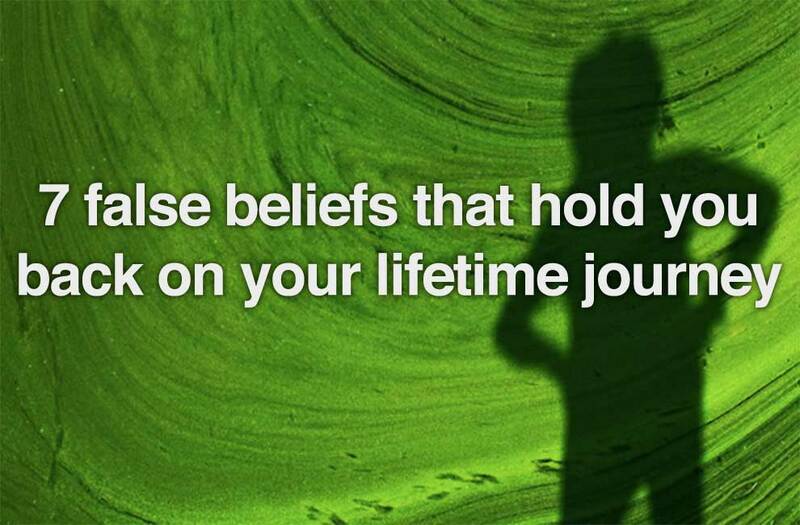 Here are 7 false beliefs to avoid brainwashing yourself with. This kind of mind-trap is a dangerous place to be. By not believing in your abilities, you are subconsciously depriving yourself from doing your best at following your dreams. Know that it is your destiny to be successful, just as it is any other person’s. The things that separate successful and unsuccessful people are that successful people believe in themselves and they don’t fear failure. They know that it is all up to them to make things work for them which gives a big drive for success. Rejection is only rejection if you let it stop you. The truth is that you may face a lot of difficulties through your life but you just have to keep your head up high and not let failure stop you from continuing on your way to your goals. If you are scared of asking for what you want from your life, you may never get it. Don’t be afraid to go after your dreams and know that every “No” takes you one step closer to the big “Yes”. Whenever I need inspiration, I search for stories of successful people on the internet or in books. What I have realized is that whatever you are trying to achieve, there will always be people who are going to judge you and who will try to kill your spirit. I think it is very important to understand that other people’s opinion of you is none of your business. But if anyone tries to make you doubt the achievability of your dreams, try to understand where this person’s reaction is coming from. Does he/she have a valid viewpoint, or is he/she just speaking from his/her fears? Often times people who judge others’ strength of pursuing their dreams, project their own fears rather than giving constructive thoughts. The most important thing is to stay true to yourself and to let your heart lead you on your journey. Whenever you have problems trusting someone, ask yourself whether the whole world really isn’t trust-worthy, if one person has once betrayed you. Avoid prejudging others because otherwise your subconscious mind will always find a way to prove the idea you have in your head to be true. If you want to see what a person is really like, prejudging will only blur the picture for you. You don’t have to trust everyone you meet but that doesn’t mean that all these people aren’t trust-worthy. Moreover, how do you expect to form a meaningful relationship with anyone, if you are not open to the world? Trust freely but be smart enough to know how to handle the toxic people in your life. Maybe you don’t often hear people or the media talking about failure, do you? If you do, maybe it’s the failure that becomes the steppingstone to later success. In my opinion, this is why we fear failure so much. A lot of people don’t realize that failure is often times a part of the path to success. Failure is not always a bad thing. Through failure we have the opportunity to grow stronger and learn new life lessons. The most important thing to do after each fall is to rise and try again. Each failure takes you one step closer to your goal. Nobody likes being hurt. But if you think about it, getting hurt isn’t something you should always fear. There are lessons in life which are meant to be learned through pain. And that means heartbreaks help you learn more about yourself and they often times even make you a stronger person who knows what he/she wants. Moreover, if you are living in a constant fear of being hurt, how will you experience the positive emotions of being close with another person? There is nothing more human than loving freely and only by opening your heart to the world, you will invite the right kind of love into your life. If you tell yourself that it is too late for you to dream big and to pursue your dreams, you need to realize that it is your belief that is limiting you, not your age. Every person has his/her unique life path and he/she is the one who creates it. It is never too late to make your dreams come true, the important thing is to take action. Remember that age is just a number and what is more important is that you have the power to achieve anything you want with the right mind-set. There are moments in life when you feel unsatisfied with the current situation you are in and it is likely that this can provoke negative emotions like the feeling of being stuck. You start feeling fear of taking action to change, excuses start piling up and you keep recalling the times in your life when you’ve failed. What you need to realize, if you are in a situation like this, is that nothing lasts forever. You are not always gong to feel like this. The sooner you understand that, the sooner you’ll recover from this emotional trap. The truth is, you have the power to do whatever you want with your life and if you don’t feel satisfied with your current situation, you can change it for the better.